Orion Light System: Illuminates the cascade waterfall and topside controls. Weight (Dry/Full) 755 lbs. / 4,410 lbs. 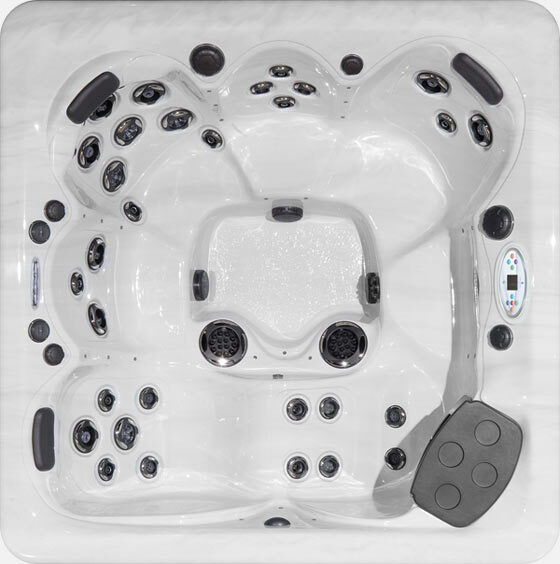 Fusion Sound System: Every Twilight Series spa may be equipped with an optional sound system to provide rich, beautiful sound. WI-FI Module: Remotely control the operations of your spa via an optional integrated Wi-Fi module that works with the Balboa Water Group Wi-Fi Spa Control App. Afterglow Jet Package: Illuminates the larger crystal-like jets in your spa. QuietFlo Water Care System: Our advanced energy-efficient circulation pump enhances the purity of the water. Mast3rPur™ Water Management System: A synergistic blend of three proven natural water sanitizers that when combined makes them dramatically more effective through a chemical reaction known as Advanced Oxidation Process. This results in clean, clear, fresh smelling, and silkier water. The Mast3rPur™ option is only available on spas equipped with the QuietFlo Water Care System. Vac Formed ABS Pan Bottom: finishes the frame with a vac formed, high density ABS base that helps keep the heat in and unwanted pests out.